It's that time of year again when Canadian motorcyclists are itching to hit the open road. Whether you're an experienced rider or just starting out, make sure you're ready to roll this riding season—safely and smartly. Buy a motorcycle that reflects your riding experience. A large, powerful motorcycle may be too difficult to manoeuvre or have too much power for an inexperienced rider. Consider all of the various riding conditions you want to explore. Are paved and unpaved roads your most likely path, or are dirt tracks and rugged off-road trails more your route? Find the body style that offers you the riding position that's most comfortable. Pin down how you plan to ride. Are you planning on taking overnight trips? Going on day trips? Or, using it to commute to work? Take into consideration whether or not you'll one day want to ride with passengers. In addition to buying a bike that fits your skills, buy a bike that fits your wallet. There's more costs to motorcycle riding than the bike, fuel, and protective gear—there's motorcycle insurance too. You'll spend plenty of time comparing motorcycles; make sure you set aside some of it to compare motorcycle insurance quotes as well. Relatives and friends may consider themselves "experts", but nothing beats learning to how to ride a motorcycle from a program designed specifically for the purpose. Many important motorcycle riding techniques and safety tips are covered in a good program that might otherwise be missed by a friend or relative. Motorcycle insurance tip: Learn how to ride a motorcycle from an expert, and save on motorcycle insurance; some insurance companies offer a motorcycle insurance discount to new riders who have taken an approved motorcycle training program. All provinces in Canada require riders and motorcycle passengers to wear helmets. It's unwise to flout this law, even if you justify it by telling yourself that you're not going far or fast. The fact is you never know what's in store; in the best case scenario all you'll get is a ticket, and in the worst case scenario you could be seriously, or fatally, injured. Use your brain, and always protect your head with a helmet when riding a motorcycle. Motorcycle helmet tip: Did you know you should never re-use a helmet that's been in an accident? It's done its job, buy a new one. According to the National Highway Traffic Administration (NHTA), a high percentage of collisions happen when the driver of the other vehicle "simply didn't see the motorcyclist", so choose gear that's brightly coloured or has reflective material, and ride with daytime headlights to improve your visibility. A motorcycle has a significantly smaller profile than a car or truck, so take the extra measures needed to ensure that others know that you're there. Motorcycle clothing tip: While on the topic of clothing, always wear protective gear (gloves, boots, long pants and a jacket) when riding, even when it's hot. Carrying passengers is best left to experienced drivers. Until you've learned your motorcycle's limitations and have considerable solo riding time, new or rusty riders should not carry passengers. Make sure your bike is equipped with a passenger seat and footrest. Adjust your bike's tire pressure and suspension to accommodate for the additional weight. Make sure your mirrors are properly adjusted. Provide, or require your passenger to wear, all the necessary protective riding motorcycle gear. Instruct your passenger, if they're not already familiar, how to sit properly, what to do when coming to a stop or turn and where to hold on. Be extra cautious when it starts to rain while on the road; oil, grease and other debris that has collected since the last rain often make roads extra slippery. Reduce your speed because it may take longer to stop and avoid sudden moves to minimize the chance of a skid. Motorcycles are harder to see than cars or trucks, so for safety reasons, it's best to pretend that you can't be seen at all and ride defensively. In particular, be more cautious when entering turns and be extra alert at intersections. Driving defensively could make all the difference, so don't tailgate, ride between lanes of slow or stopped traffic, and always position yourself in the lane where you're most likely to be seen by other drivers. Also, watch for how other vehicles are reacting to the road ahead. 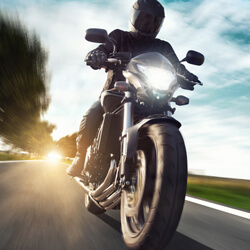 How others are driving will give you insight on what's approaching but remember, what's a minor annoyance for a car could be a considerable hazard to a motorcycle rider. Make sure you give yourself the space needed to avoid a hazard in a timely, and safe, manner. Since the season is changing and we're riding into motorcycle weather, see if you could spend less on your motorcycle insurance. The open road is calling for a better deal, and Kanetix.ca can help you shop around for a better price.